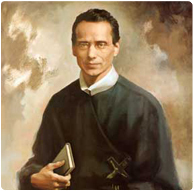 The Redemptorists » Happy Feast of Blessed Francis Seelos! No one could look upon him, especially when at the altar, or in the pulpit, without feeling that there was immeasurably more of heaven than earth about this devoted servant of Christ. … The many who sought his spiritual guidance knew his only human weakness was his overflowing sympathy and charity for poor erring humanity. Please pray this weekend for the young men from across the country who will be attending a vocations retreat at the Shrine of Blessed Seelos in New Orleans, LA! and the meditation of my heart be pleasing in your sight. on your humble Redemptorist missionary, Blessed Francis Xavier Seelos. and live faithfully your gospel. Amen. For more about Blessed Seelos, visit www.seelos.org.